Welcome to Twobobs Aviation Graphics! Our website features over 350 decal products that will help you put the finishing touches on your modeling masterpiece. View our latest releases below. More items are available using the navigation tabs at the top/side of this page..
03/25/19 - 48-086 AIM-9/AIM-7 Missile Markings are temporarily out of stock. More on the way! 03/11/19 - Preview is up of 48-264 CF-188 60 Years of NORAD Demo Hornet!! 03/11/19 - Previews are up of 72nd/32nd F-15E Maximum Effort Eagles!! 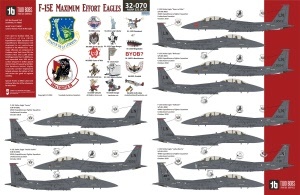 02/26/19 - 48-265 F-15E Maximum Effort Eagles Now Available for Order!! 11/05/18 - We now accept Paypal!! 08/22/18 - Clearance Sale Continues! Lots of great deals still available! 1/30/16 - Free 48th scale Missile Markings sheet with every T-45 Goshawk order until remaining kits are sold out! Load the Grill! Drop the Fry Baskets! 72-108 and 48-263 EA-18G Pew Pew Growlers are now Available for Order! Very topical and popular scheme from the Star Warriors of VAQ-209! Black Friday Clearance Sale Continues! Christmas is right around the corner but that doesn't mean that our sale is over. All discounted sheets will remain on sale until inventory is depleted. Many sheets are extremely close to being sold out so get em while you can! We're on social media! For all the latest news and product announcements, visit us on Facebook, Twitter or contact us via Email using these links! Have any ideas/references for a new decal subject? We'd love to hear from you! Two Accurate, Two Colorful, Twobobs! Part II of of our continuing coverage of the new Aggressor schemes coming out of the 18th FS in Eielson AB! The BDU Splinter, Blue Splinter and the newest Arctic Splinter all follow the same schematic pattern as the previous Alaskan Splinter jets. We have also included a couple of the all black scheme as well as an all gray scheme on this sheet. The single color schemes were resident on the jets during their ferry flights to Eielson. 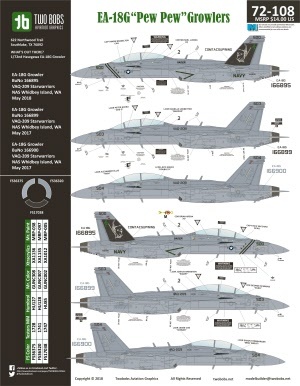 Included in the sheet are complete markings and stencils for the BDU Splinter scheme and options for either the Blue or Arctic Splinter aircraft. There are also complete markings for both single color, ferry schemes. Not to be outdone by the new aggressor schemes at Nellis AFB, the 359th FW at Eielson AFB, AK have generated a new splinter scheme of their own. Designed by squadron personnel, these schemes flew for the first time in early 2017. Twobobs worked directly with squadron personnel to ensure that every subtle detail of these unique markings were captured accurately. Included in the sheet are two complete sets of markings and stencils for both splinter jets. The walkway lines are printed in three different colors to allow the modeler to accurately match the walkway lines to the paint schemes as applied. On April 3, 201 the 4th Wing Col Lake,Alberta unviled the 60th Anniversary of NORAD paint scheme to the public. Captain Jeff Chester and Mr. Jim Belliveau were the designers of this scheme and the 1 Air Maintenance Squadron was the organization that brought this design to life. Twobobs worked directly with the RCAF and this sheet would not be possible without their reference photos and technical information of this paint scheme. Instruction sheets are our new 11" X 17" format and include model paint matches and other information on this scheme. VAQ-209 is the only Navy Reserve squadron that flies the EA-18G and are known as the "Star Warriors". They are based out of NAS Whidbey Island, Washington. This decal sheet provides options for three different AC, one CAG and two line jets. There are enough stencils for the CAG aircraft and one of the line aircraft. The BDU Splinter, Blue Splinter and the newest Arctic Splinter all follow the same schematic pattern as the previous Alaskan Splinter jets. Included in the sheet are complete markings and stencils for all three splinter aircraft! Important Note! The markings for the all gray jet are NOT included in this set. 1/72nd scale markings for this jet are included in the 48th scale offering of this product (48-262). The world famous 4-grit sanding stick from Twobobs! You can never have enough of these laying around. 4 different grits on each stick from extra coarse to extra fine. Great for all those hard to reach places where your sausage fingers just won't fit. Easily cleaned by either slapping against a firm object or running underneath some tap water.